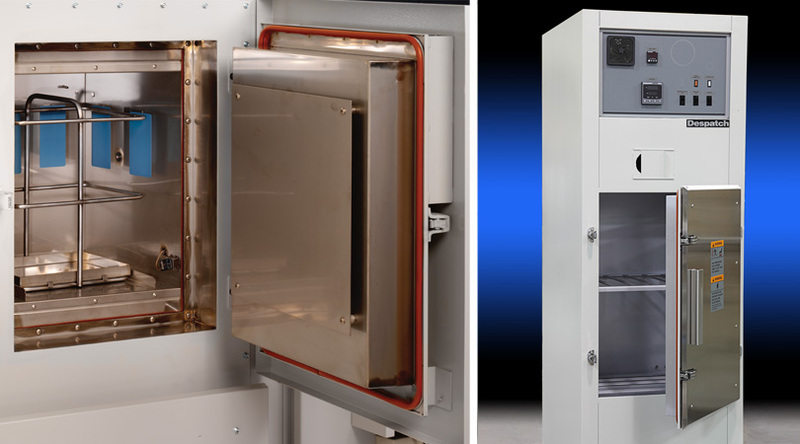 The PRVO Despatch Paint Sample Drying Oven is a Class A (NFPA 86) oven designed for small batch laboratory testing of paint finishes used in automotive and other high volume applications. The PRVO has the ability to test paints, including flammable solvent based paints, for temperature, ramp rates, curing time with gas or electric heat. Controls are conveniently located on the front of the oven, including the fresh air control. The high-volume recirculating vertical up airflow with fixed louvers on the supply and return ducts provide uniform airflow to all parts in the work chamber for consistent temperature uniformity throughout the work chamber and reliable process results. A recirculating air filtration system is available as an option to prevent contamination of the paint finish. 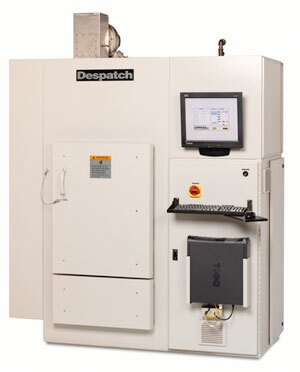 Designed in cooperation with a major automobile producer and international paint supplier, Despatch developed a custom, "chamber in chamber" paint sample testing tool. New paint formulations now require the added variables of NOx concentration, Dew point levels, volatile organic content control, airflow velocity control and air turn over rates. The oven was created as a small lab tool that can accurately replicate the paint curing process in a full-size production facility. The outer chamber of the oven simulates the temperature of a full production line and the inner testing chamber represents the characteristics of the production oven where the actual paint curing takes place. The oven boasts state-of-the-art software that allows the customer the capability to adjust the parameters of the oven in order to simulate the characteristics of any type of production oven (radiant, direct gas heated or electric convection) and to replicate the environmental conditions surrounding a specific production facility, given its geographic location and heating method.